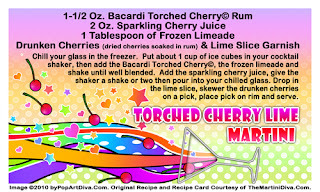 I've been experimenting with Bacardi Torched Cherry® Rum and have discovered I really like it! Of course, if you read this blog a lot you already know I love cherries so this rum was kind of a no-brainer for me. My first martini with the Torched Cherry was actually a daiquiri - The Bing Cherry Daiquiri-Tini - which is a frozen cocktail. Sweet, cherry-licious and like having an adult cherry slushie -Yum! For this Torched Cherry Lime Martini I went for a classic cocktail "straight up", cocktail that is drink that is shaken or stirred with ice and then strained and served without ice in a stemmed glass. This one has a decidedly tart zing to it which will please those who prefer a less sweet cocktail. Another Yum! Kind of makes you wanna do a little Karaoke to Neil Diamond's Cherry Cherry, huh?